I’ve been rethinking my wardrobe a lot lately. It seems every time I go through my closet in search of an outfit, I feel less and less attached to much of the pieces hanging there. I often have an idea for an outfit, only to find I don’t actually own something I had in mind, which is definitely a first world problem, really, but when I got thinking about it, I came to realize maybe I own too many things that don’t do anything for me anymore and I likely need to make room for pieces I feel a real connection to; I don’t necessarily have a desire to change my style, but I think honing it a bit more would so me some good. That being said, this burnt orange pinafore by Mod Dolly seems a perfect starting point for me. The marriage of colour, simplicity, versatility and sweetness really got me with this one and I realize those four words should be ever-present when thinking of the clothes I own. I’m certainly not jumping on the capsule wardrobe bandwagon – I’ll never be that practical – but being a bit more thoughtful with my choices seems more and more desirable to me these days. Love this outfit and those shoes are cute! And welcome, friends! 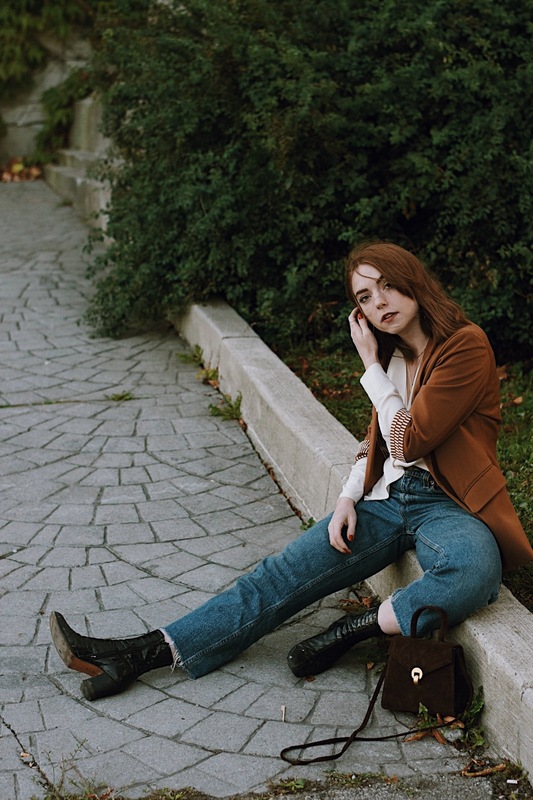 I'm a 29 year old Toronto style blogger, but mostly a lover of Bichon Frises, vintage, nature, contemporary dance, feelings, and jokes.